To help you keep your mouth and teeth healthy as long as you can. To create a natural and beautiful smile that enhances your unique features. To help you understand the cause of your problem so you can make an informed decision about your dental needs. To care for you with sympathy as a family member. To provide personalized service so your dental visit will be more relaxing, comfortable, and positive. To keep up with the newest techniques and latest procedures. To protect our patients and ourselves by following the infection control standards of the American Dental Association, Centers for Disease Control and Prevention, and OSHA. 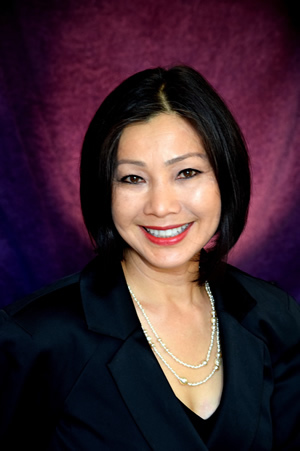 Dr. Lam has practiced dentistry in Sacramento and Davis since graduating from the University of California, San Francisco School of Dentistry in 1988. She has completed extensive training beyond general dentistry to integrate the complex factors of oral health into her practice; providing you with the very best dental care. Dr. Lam trained in gum and bone disease for general dentistry at the University of Pacific Arthur A Dugoni School of Dentistry and later on with Dr. Swanson, a periodontist, for 13 years beginning in 1989. She completed a two-year training in orthodontics for general dentistry at the Academy of GP Orthodontics in 1992, and served as a clinical assistant instructor for the program. She completed advanced dental training at both the Dawson Academy and The Pankey Institute in 2005. Dr. Lam began her implant training with Calcitek in 1991, and continued surgical implant residency with Nobel Biocare in 1992. She completed both advanced implant residency and prosthetic residency with Dr. Carl Misch in 2014, and became a fellow of the International Congress of Oral Implantologists. She has given lectures on dentures, and has taught interdisciplinary treatment plan for complex cases in several organizations. Dr Lam has been serving as a CPR instructor for Sacramento District Dental Society since 1991. Her passion for dentistry and care for her patients surprise them when she actually cooks nutritious meals for the ones in need.